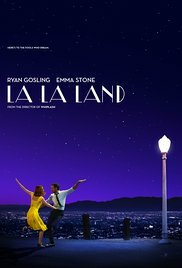 La La Land received the full Hollywood treatment with extravagant musical numbers, A-list actors, compelling characters, and a blossoming romance. But did it have the classic Hollywood ending? I won't spoil that for you. The story centers around Mia, played by Emma Stone, and Sebastian, played by Ryan Gosling, who keep meeting by happenstance and end up falling in love under the backdrop of Los Angeles stars. He is a jazz musician and she is an aspiring actress and playwright. They both struggle with pursuing their artistic passions while at the same time making enough money to support themselves. They reach a point where they have to decide whether to follow their dreams or maintain their commitment to one another. Even if you are not a fan of musicals, you will enjoy this film. The musical numbers aren't forced and generally flow well within the story. While the acting was good, the lack of singing ability from the two stars was noticeable in some instances, and the choice of music could have been better. Despite being a musical, the film didn't produce any one song that was particularly memorable.The movie is very full of life and well representative of the Los Angeles/Hollywood culture and mystique. This film teaches us about art, love, relationships, dreams, and life in general. I left the theater looking at many aspects of my life in new ways--which is a good thing. This is a film that is well-deserving of its many accolades.